iPhone 6 users get some extra goodies with the new optional pressure data reporting that uses the barometer sensor on the iPhone 6 and iPhone 6 Plus. Owners of the newest iPhones can opt-in to “periodically” send pressure data to Dark Sky, allowing the app to tap into a vast new array of sensors across the U.S. to make it’s forecasts more accurate. 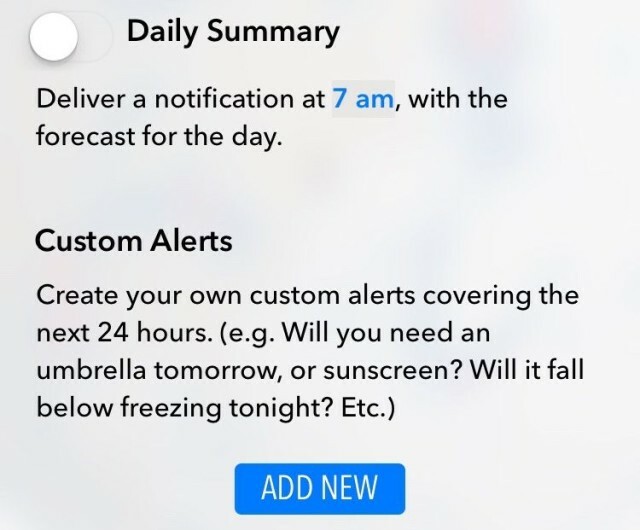 Alerts are now fully customizable and their more useful than ever. You can create notifications for things like when it’s about to rain or snow, UX indexes, daily summaries, wind speed, severe weather alerts, and humidity, so you can stay ahead of the game by taming those curls before stepping outside. You can also change the variables so you get notifications when the whether drops below a certain temperature. The redesigned app still lets you slide between screens in Dark Sky to switch from the current forecast and upcoming 24 hours, an entire 7-day forecast (still with minute-by-minute precipitation details) and a new page for your various alerts. As for the UI changes: they’re nice, but the app isn’t quite as pretty as it used to be. It’s still super reliable though, and has more detailed information. The 5.0 update is free to all Dark Sky users, but if you haven’t bought it yet, you can grab it for $4 in the App Store.